After installing Kodi on a Fire TV Stick, I wanted to share this tutorial on how to install IPVanish VPN on Amazon Fire TV Stick in about 5 minutes! Update: IPVanish is Now on the Amazon App Store! Last week, I shared how to install Kodi on a Fire TV Stick. Now, since there are some good reasons to use a VPN when streaming Kodi, I wanted to share this tutorial on how to install IPVanish VPN on Amazon Fire TV Stick. I used to think it was not possible to install IPVanish VPN on Amazon Fire TV Stick. After all, the official page on the IPVanish site says it can’t be done. However, after installing Kodi on it, I realized how easy it was to sideload APK files onto a Fire TV Stick. If I could do it with the Kodi app, why not the IPVanish app? Well, you can do it, and it’s easy! It takes less than 5 minutes. If you are wanting to install IPVanish on an older 1st gen Fire Stick, unfortunately, it doesn’t work. It used to not appear to work at all, and then it got an update and appeared to work. People were able to install and connect. However, I started getting reports in the comments from people who were testing the external IP address (mentioned at the bottom of this post), and it turned out to not be working on 1st gen Fire Sticks. If anyone discovers anything otherwise, or finds a workaround, please let me know in the comments. In order to install IPVanish VPN, you’ll need the “All-New 2nd gen Fire TV Stick with Alexa Voice Remote” which is only $40 and runs Kodi very well. Note: This also works on any Amazon Fire TV box! That’s right! Unless you want to skip to the bottom of this post to learn more about IPVanish, you can pretty much ignore the rest which is now obsolete. So, just head on over to the Amazon App Store on your Fire TV or Stick, and search for IPVanish. Download and install adbLink on your computer (Windows / Mac OS X 10.7+ / Linux). On your Fire TV Stick, navigate to Settings > System > Developer Options and turn ON both options (Apps from Unknown Sources and ADB Debugging). Find and take note of your Fire Stick’s IP address by going to Settings > System > About > Network. Open adbLink on your computer (which you downloaded and installed earlier). In Description, give your Fire TV Stick a name. In Address, type the IP address of your Fire TV Stick that you took note of earlier. Click the Connect button, and you should see your Fire TV Stick’s IP show in the Connected Devices box. Then click the Install APK button, navigate to the IPVanish APK file you downloaded earlier and select it. You will see a popup asking if you really want to install the APK. Click Yes. You should see a small progress bar in the bottom right corner of the screen letting you know it’s working. It should take a minute or two, so be patient. When it’s done, you’ll see a popup that says Installed. All done! You should now see IPVanish VPN in the Apps section of the Fire TV home screen. The above instructions should be pretty easy, but in case you need some visuals to make sure you’re in the right place, here are some screenshots. IPVanish is a VPN service that encrypts your Internet traffic, hides your IP, spoofs your location, and much more. If you’re going to be using Kodi unofficial add-ons for streaming or downloading, I recommend using a VPN. Curious why you would need a VPN? Check out my post on 4 Reasons Why Kodi Streamers Need a VPN. Use coupon code TECH25 for 25% off any plan with IPVanish VPN! Plus, it comes with a 7-day money-back guarantee to make sure it works well for you. Please note that the IP address seen in your network settings is your internal LAN IP address and it usually starts with 192.168.x.x. This is completely separate from these discussions. That won’t change and has nothing to do with the VPN. What you need to look for is your external IP address. It should change when you connect or disconnect from your VPN. Normally, it’s as simple as going to one of a bunch of websites that will show you your external IP address, including just typing “IP” in a Google search. However, on a Fire Stick, it’s not that easy because there’s no web browser. So, instead here’s another way to see your external IP address from within Kodi. Install Indigo and open it. Any Questions or Issues with Installing IPVanish on Fire Stick? Please let me know in the comments below if you get stuck somewhere or run across issues. I’m happy to help. Richard, I contacted IPVanish about this issue and they’re saying that it might not be compatible on some Fire Stick devices yet. Which version of the Fire Stick do you have? I just tested it and it’s working fine for me on my all-new Fire TV Stick with Alexa running Fire OS 5.2.2.0. Do you have an older Fire Stick? Just a note….. you no longer can root the firestick unless you have an older version!! If you could root it then your VPN would work!! Yes, Douglas. I found the same thing that IPVanish works fine only on the latest version of the Fire Stick with Alexa. Is it the one that says “with Alexa Voice Remote”? That’s the one that works. Hello, I managed to install ipvanish onto my firestick and selected the country of choice but I noticed the IP Address was locating… for what seemed ages, nevertheless I thought I would see if I was able to get BBC iplayer from uk, unfortunately firestick seemed to have lost internet connection with message “Home unavailable, check internet connection” I am assuming the cause is the lack of IP Address earlier on installed IPvanish. Am I correct if so how do I get it working on VPN? Do you have the latest version of the Fire TV Stick “with Alexa Voice Remote”? Apparently that’s the only one that works with IPVanish. Hi Nathan, no I don’t have the voice version, wonder why that is!! Cheers. Decided to buy another Fire Stick With Voice Remote but I have the same problem with this one message comes up “Home unavailable check internet connection” when I check the connection it says connected with problems. Works fine without IPvanish. “Home unavailable”? Where is it coming up with that message? Are you saying you lose Internet connectivity when connected to IPVanish? Which server are you connected to? I am having the same issue… After ipVanish is running for just a couple minutes I end up losing internet connection on my Firestick, and it won’t allow me to do anything until I restart the firestick by unplugging and replugging. I haven’t tried doing a full re-install quite yet just to rule out something wierd.. Any tips? Do you have the latest model fire stick? I just checked I thought I did, but I have the Firestick w/ Voice not the Alexa one. So they have 3 versions out in reality… So I’m working on for now using IPVanish on my Laptop with a shared network connection to the Firestick until I can get a new one or they figure out a way to make it work with the 2nd model of it. Cool, glad you figured it out. That’s strange. It works for me and we have the same Fire TV Stick with Alex Voice Remote. One more thing… check your OS version and see if it has an update. Make sure you’re on at least Fire OS 5.2.2.0. If that doesn’t work, you should reach out to IPVanish support to see if they can help fix your issue. The OS version on my voice remote is 5.2.1.1 no update available. Will this work on the Fire TV? Yes, it has been reported to work fine on Fire TV. when i have IPvanish active and connected i check on the network page located in the systems section of the amazon fire stick and my ip address is the not the same as the ip address that ipvanish is giving me. It is the ip address for my wireless network that is still showing up. Not sure Tom but thinking that IP is unique to the firestick and is not a public IP. Has anyone anywhere found a work around yet for the older firesticks? I was at Best Buy last week and they were still selling the older firesticks and most people will think their covered while using a VPN. Can you tell me where you bought your Firestick with Alex Voice Remote and OS 5.2.2.0? Met with the Home unavailable screen and internet lost , how can I uninstall it ? From the Home screen, select Settings > Manage All Applications. Scroll up or down to find the app you want to uninstall, and select it. Select Uninstall, and then follow the onscreen instructions. I installed the apk file but the app does not show up on home screen – I’m unable to find it. It appeared to be a successful load. Is there a step I’m missing? No other steps. Did you look in the Apps section of the home screen? Did the program says Success? Thanks for your reply. I don’t think it actually installed. There was an issue with my having two adblinks running at once which I noticed in process explorer. I uninstalled and then cleaned up files that were not uninstalled properly, then reinstalled adblink. I was able to install ipVanish. After a hard time finding the app on firestick i got it to run. Then I resumed a stream of a program I had been watching from Amazon Prime, It wouldn’t start saying there was a Geo block of some sort. I was flabbergasted. Isn’t one of the main points of ipVanish to prevent geo blocking? Do you have to select a certain server to avoid blocking? If so how do you know which server will work? If you’re in the middle of a stream and the switch on your VPN, that will kill the current stream. Streaming a video involves somewhat of a handshake between device and server. When you turn on your VPN, it breaks that handshake because you’re suddenly located at a different IP address. You need to reinitiate the stream. Now, in your specific case, it’s Amazon Prime, so it may not start the stream again with the Geo block message because they might have started blocking the use of VPNs. I know that Netflix and Hulu started doing that earlier this year. It’s possible that Amazon is doing it too. If so, you’ll need to disable the VPN while your using these legitimate paid services that make use of VPN blocking. It is as simple as clicking the Disconnect button in the IPVanish app. Is it free to have IPvanish installed and working on the firestick running Kodi? It’s a monthly (or yearly) charge for the service. Go to https://kinkeadtech.com/ipvanish and pick a plan and check out. When you’re done, you’ll login to the app with your email and password that you created at checkout. Let me know if you have any other questions. any thanks in advance for any help you can give. Perhaps I have the first edition? Would everything have installed if it was the 1st edition? That’s exactly what I was thinking. You need the latest Fire TV Stick with Alexa voice remote which has the latest OS version. My ipvanish worked once…. Now it says connected, but IP never changes. What IP never changes? Where are you checking your IP? I have the same issue. IPVanish says “connected,” yet it is showing my actual IP address under “Location” (despite being a different city). Am I still protected? Are you talking about location settings? That is a manually configured setting on the Fire Stick and a VPN won’t change that. I don’t think that would have any impact on this. What you can do it Google search “ip” and see what IP it gives. Then using a IP locator site to see what location that IP is known to be in. Or, you might be able to just go to Google maps and it would center in on the location that it thinks you’re in. Yeah either a resolution for the FireTV Stick 5.2.1.1 would be great or I need a new one….or buy a FireTV? Damn decisions decisions again…. I just checked my Amazon account, and saw that I purchased the Fore Stick with Alexa voice. Just to be sure, how do I find the Fire Stick OS? Thank you! Thank you Nathan, I got technically brave and was able to find it. Also, I do have the Alexa Voice Fire Stick, but it is only version 5.1.1. So the ipvanish probably won’t work. If you don’t mind, I have 2 more questions. I’ve noticed that here on your site you talk about updating kodi. Is there somewhere on your web site where you give directions on how to do this, and how oft it should be done? And, what might happen if it is not regularly updated? We are in the process of “cutting the cord”, so we might be relying on kodi quite a bit. Thank you Nathan! Do I need to delete the old version first, or will this overwright it? I believe it should overwrite it. I tried to download the apk file for android onto my iPad, mac desktop, and a windows computer without any luck. None of them recognized the file. Any suggestions? Oh, thank you for pointing out a step I missed. I can’t link directly to the .apk file, so I zipped it. Be sure to unzip it to get the .apk file inside. I updated the post. Thanks. Thank you Nathan! I did unzip it. Neither my windows laptop nor my mac desktop would recognize the file after unzipping it. I had both do an online search, and both of them found nothing to open an android file. I’m sure I’m doing something wrong, just can’t figure it out. You’re not supposed to open in on your computer. Follow the rest of the tutorial to see how you browse for that file within the adbLink program. Hi Nathan, I was able to get ipvanish onto the fire stick. When I go to their web site, they will have me pay, and then allow me to make a log in and password that I can use when I open it on the fire stick, correct. After that, I go to the fire stick again, log in on the ipvanish app, and then is there anything else I need to do, or just open the NHL app and watch my home teams game? Also, if it doesn’t do what I need it to do, how good is ipvanish on their refunds? I only need it for the hockey games. They’re very good on refunds. You have 7 days to decide if it will work for you. Yes, after you checkout, you will be able to sign in using your same login in the IPVanish app. Once signed in, you will have some settings to pick a server if you want (either by speed or by geographical location), and you’ll have a “Connect” button. Once connected, then open the NHL app, and it should see you as coming from the country of the server that you selected. Now, if it doesn’t work, be sure to check your account settings. You may have your address in there and it would be using that to block games. I’m just getting my Kodi set up. I have the Alexa Fire Stick. Will be adding add ons this week. So far I have just Kodi. Then I stumbled upon this VPN thingy. I understand why I need it. Do I just open up Kodi and DL as per instructions? From there it knows that whenever I’m in Kodi to block my IP? And when I open an add on such as Exodus it knows to block that info (for lack of better terminology)? I’m just trying to picture how it works. Is it like anti-virus on my PC? Where when I’m in Windows (Kodi) my Norton anti-virus (IPVanish) is protecting me when I’m browsing and downloading stuff (Exodus, 1channel, etc) via Chrome? Yes, it’s like Antivirus in that it runs at the operating system level and protects the whole computer. A VPN will install on your FireStick as an Android app that you have to sideload using my tutorial. The VPN will cover all network activity on the FireStick while it’s connected, including Kodi. I have ipvanished installed on my firestick. It has worked for the last 30 days. Today I noticed it wasn’t connected. When click connect it just says “reconnecting” and seems to be looping between authenticating and trying again repeatedly. All the computers on same network are working with ipvanish. Changing servers does no good. Reset to default settings. Rebooted the firestick. I can’t seem to connnect. Hey Jolly. Thanks for reaching out. Let me see if I can help. You have other computers running IPVanish on them and those are working fine? How many computers? The reason I ask is that there is a limit of the number of devices that you can install IPVanish on. It should be limited to 5 devices. My other thought is that your subscription may have expired due to no renewal payment. I only think to ask that because you said it has been working for the last 30 days. If you signed up for monthly and it didn’t auto-renew, that would explain it. Thanks for the response. I noticed ipvanish sent out an email saying users would need to install a new update on January 10th because things were changing behind the scenes and some users would be not be able to connect without it. I did so manually and all it working again. Glad it was nothing more complicated than that. ;) But I wanted to update here in case anyone else runs into the issue. I grabbed the APK of the latest version of the IPVanish Android app and updated this tutorial with the new download link. Give that a try. I am having an issue figuring out how to do this update on my Firestick. Any advice? I would be happy to help. Where in the process are you having an issue? Hi! Are the installation instructions the same for Mac users? If not, how can this be done using a Mac? Also, is IPVanish the only vpn that can be loaded? I currently have Nord VPN. And I have the fire stick with Alexa. Thank you!! You need both files. One is the APK file (Android app package), and the other is ADBlink which is specific to your computer’s operating system. Get ADBlink for your OS, and then follow the instructions where you use that program to choose the APK file you downloaded, and it will push to your FireStick and install on there. FireStick runs Android. I hope that helps. Now regarding the VPN, no, IPVanish is not the only choice, it’s just my recommended choice. I’m not familiar with Nord VPN, but if they have an Android app, then you might be able to follow these instructions with that (if you can get a hold of the apk file). Hello Nathan. Thank you for posting this tutorial up for everyone. I purchased IPVanish with your TECH25 promo code. I need some help on a step that isn’t working for me. “In Address, type the IP address of your Fire TV Stick that you took note of earlier.” I have noted the IP on my Fire TV, but when I hit done on the adbLink program, and then hit connect, nothing happens. It won’t connect and I have no idea why. Nothing happens at all when I click on connect. Oh, thank you for bringing this to my attention. I grabbed the APK of the latest version of the IPVanish Android app and updated this tutorial with the new download link. Give that a try. Sorry for the delay, i was unable to connect to my 2nd FS until last night. Your update worked perfectly, thank you so much for taking the time to do this! On a side-note I figured out why my 2nd FS could not connect to the adbLink. Apparently this particular FS was showing 2 different ip addresses. I as able to go to System/About on 1 and pull the ip address, connect, install the APK and all was good. Tried for days with this method on the 2nd with no luck. I finally pulled the ip address from the Settings screen of the FS before even getting into Kodi and it was different than the ip address once I was actually in Kodi. Used this other one and bam, success. Thank you one again Nathan! You’re welcome. I’m glad you got it all figured out. Hi! I have IPvanish now successfully installed on my Firestick. What settings should I have on IPvanish? I clicked to automatically connect and connect to fastest server in the country. Do I just close the app out and open whatever app on the firestick I want to use? I was under the impression that I was being throttled. I followed the above and can get VPN connection successfully. However, each time I attempt to fire up Kodi with VPN my connection to the network on my firestick drops. What could be causing this? I have a relatively new fire stick, I checked for system updates, I have it in developer mode. I’m sick of the buffering! Save me Nathan! You say you have a relatively new fire stick. It has to be the newest one that has the Alexa voice remote. All the previous versions of Fire Stick are not compatible with VPNs. Google search for “ip” and it will give you a different IP on that device than it will on other devices in your home. Sorry it’s not clear enough. Also, I just realized that part of the post is obsolete and needs to be updated because Fusion in gone. You would need to Google search the word “IP” from a browser in the Fire Stick. Unfortunately, the Fire Stick doesn’t come with a browser. However, if you installed the “Downloader” app on the Fire Stick, you should be able to use that as a browser and run a Google search. I am now trying to find instructions to install the IPVanish on my Invidia Box. Can you direct me to a link? I replied to you in your forum post. I hope that helps. So once i have IPVanish installed onto my FireTV and am successfully logged in, when it says “connected”, am I safe to assume that when I fire up my Kodi app and begin using it, the IPVanish app that connected prior to loading Kodi on my FireTV is still working as a VPN to all Kodi streams? Just hoping to get confirmation on that… Thank you! The IP address seen in your network settings is your internal LAN IP address and it usually starts with 192.168.x.x. This is completely separate from these discussions. That won’t change. Do this. Before connecting to IPVanish, go to https://myiplocation.org/ and see what IP and location it says. This is how the Internet sees you without a VPN. The location is usually very approximate to somewhere in your city, usually where your ISP is based. Now, connect to IPVanish and then refresh that website. You should see the IP address and location change to match the server that you have selected in the IPVanish app. This is how the Internet sees you when you’re connected to your IPVanish VPN. Have you subscribed to the service using the same account that you logged in with? Hi,will this method only work on the latest version of kodi still, I have two of the original firesticks! Correct. IPVanish VPN will not work on original FireSticks. What says locating and never gives you one? The IPVanish app? I’ve been trying to download the apk for almost 45 mins now but when the loading bar finally goes to the end it just restarts. Is this supposed to happen? By “download”, do you mean downloading from the link on my website? Or do you mean pushing the APK file to your FireStick via adbLink? Pushing the file should only take a minute, so there must be something wrong if that’s happening. Perhaps try the other method. Can I use IPVanish on the newest model of the Fire Stick without requiring Tomato or DD-WRT firmware on my router? i.e. can I just use my regular router without modification? You cannot use a regular router to do this. But, you can install the IPVanish app directly on the FireStick to cover just your traffic from the FireStick (as long as it’s the newest model with Alexa Voice Remote). If you want to install the VPN to protect your entire house, you’ll need to buy a FlashRouter with Tomato or DD-WRT. Thanks! So, as long as I am only using VPN for the Fire Stick (with the app directly on the fire stick) I do not need a Flash Router, correct? Just downloaded and installed IPVanish on my Alexa Fire Stick and at first it connected and had the graph showing the connection but then it disconnected and now will not stay connected. Also, I have a problem seeing the entire ipvanish screen, the sides are too far left and right to read. Tried changing format on TV but only have wide and zoom available (older TV). How do I get this to stay connected? got it fixed..changed server and that did the trick! So, you do have the latest Fire TV Stick with Alexa Voice Remote? Is the OS up to date? Go to settings and check for updates. If it still doesn’t work, I’m not sure what to try. I assume you did subscribe for monthly or yearly service with IPVanish, right? We recently got ipvanish for our firestick and when we tried both, the quick connect and choosing a server it starts to connect then says disconnected. What am I doing wrong? Is it the latest model Fire TV Stick with Alexa Voice Remote? VPNs like IPVanish are not compatible with earlier versions of Fire Sticks. I have installed the latest version of IP Vanish which is 3.0.13.987 on my Amazon Fire Stick. I have logged in checked my IP Address & then clicked Connect & the IP Address has not changed but the location has? Why is my IP Address not changing, am I doing something wrong. I have a 2nd Generation Fire Stick. What IP address are you looking at? Every device has an internal IP and an external IP. The internal IP won’t change, but the external will appear to change from out the outside. The IPVanish app will show your real external IP address, because they see where you are. But because of their VPN service, other websites will not see your real IP address, but they see one of IPVanish’s. Yes, with one account, you can install the app on up to 5 devices. I’ve got IPVanish installed and running on my Amazon Fire Stick, but I’m confused about your instructions on how to check to see if it is really working. You say “go to https://myiplocation.org and see what IP and location it says”. Are you saying open some sort of browser on the Fire Stick? How do I do that? Obviously if I go to a computer on my local network and do this, I’m going to always see my IP provider’s ip address, so that’s not going to confirm whether or not IPVanish is working on my Fire Stick. Can you clear this up? I’d really like to feel confident that IPVanish is truly hiding my ip when the Fire Stick streams content. Hey- I asked the same question. I see you did not get a reply. Did you figure out how to confirm IPvanish is working on your stick? Thanks! I’ve updated that section of this post with the steps to use the Indigo add-on to check your external IP address and see it change when you connect to IPVanish. Have a look. Good news, the IPVanish app is now available on the Amazon App Store, rendering these complicated instructions obsolete. Let me know if you have any issues getting it to work. Thanks! Hi. Thanks for the guide. I have the latest fire stick and IPVanishVPN versions. It is installed properly and works. It’s the speeds that are the problem. I have a native download speed of 70 to 90mb. When I run speed test on my iPad with ipvanish on I get speeds of 30 – 60 MB per second which is not great but acceptable. When I run same Speedtest on fire stick on the same server I get speeds of 2 to 6 mb speeds which is not. If I auto connect it connects me to servers across the country. It’s as if it thinks I am somewhere else. I have done everything I think off including wiping everything and reinstalling, resetting router, Trying the different openvon options and tons of servers. It should run the same as my iPad or at least close. I need a fix! Any ideas? 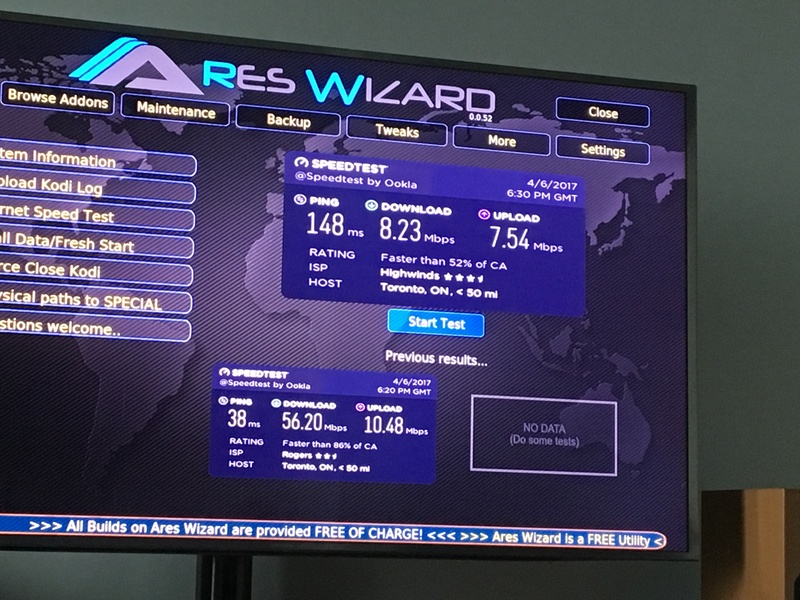 Brisk, was your FireStick getting the same 70-90 mbps speed tests with the VPN disconnected? I want to make sure you’re comparing apples to apples, just in case your Fire Stick is getting a weaker wifi signal or something. Also, again, to compare apples to apples, make sure to manually connect your Fire Stick to the same VPN server that your iPad was connected to when it got those acceptable speeds. The auto-connect feature looks for the server with the fastest response time and connects to that one, regardless of where it is. If you have speed issues with ones that are selected automatically, you might want to find one that works for you and set it to auto-connect to that one manually. If you check all these things and you’re still not getting the same speed on your Fire Stick, it could be something wrong with the Fire Stick. Maybe its wifi is not as capable as your iPad, or maybe it’s not capable of encrypting and decrypting data as quickly as the iPad. Do you have the original or 2nd gen Fire Stick? Is it necessary to embed vpn in kodi or can it just run separately on the device? If you use IPVanish, it does run separately on the device, covering all the traffic to and from the device. I stalled and now my tv is hung up! I would like to help, but I don’t know what you mean. Can you please elaborate? Okay. IPVanish installed and ran Kodi just fine on Fire TV. Neither Netflix nor Amazon TV will work with it installed. What did I miss? Am I to now manually change the Fire TV IP address to match the new IP address set by IPVanish? I see where I can do that, but is it an instruction that I missed or…? No, you don’t need to change your IP address. Netflix and Amazon Instant Video have technology that detects the use of a VPN, and they block it. If you want to use those, just click the disconnect button in the IPVanish app. Hi, have installed ipvanish as per your instructions but my external ip is still showing as my home (uk) one – so don’t think it’s working – this is a first generation firestick. Any thoughts please ? Did you check your external IP using the Indigo plugin or using another method? You said you installed it, but did you open the IPVanish app, login to your account, and click the connect button? I just want to make sure. Geoff, I just replied to your forum post, but I’ll update it here to in case others have the same issue. I just tested it again myself and it’s working perfectly. The external IP address showing in Indigo changed after I connected the IPVanish app. However, I did notice that the IPVanish APK file that I linked to in my post was old (3.0.4). I just updated the link to the latest version (3.0.14). Maybe that was the problem. Just got round to setting up again using the newest APK file 3.0,14 but afraid that in Indigo my local IP is still showing so am afraid this is still not working for me. Geoff, a VPN will have no affect on your Local IP. That is the IP that is only defined within your house. What you care about is your External IP address. That is the IP address that defines who you are and where you are to the world. That’s what servers see. When you connect to IPVanish, then in Indigo, you should back out and then go back into the System Information page and you should see the External IP address change to something different. Look up that IP in an IP locator website, and it should not show your location, but the location of the IPVanish server you’re connecting to. 2) Which version of Fire Stick do you have? Original 1st gen or the new 2nd gen with Alexa Voice Remote? Geoff, it turns out the you and a couple others here in the comments are reporting the same issue. I just tested this myself and it was working perfectly, so I want to help you guys figure this out. Hi Nathan, just to clarify what I am doing, firstly opening the IP Vanish app and then click connect – it states connected to a server in New York, I then click Home and open Kodi ( version 16.1) then open Indigo and click on System Information from where I can see the external IP address is still my local UK one. Geoff, I’ve now heard from a few people who are using 1st gen Fire Sticks running into the same issue. I guess the 1st gen Fire Stick still doesn’t support VPNs, even though the app now appears to work. I’ll update the post soon to address this situation. Hi. Really struggling here. I’ve downloaded ipvanish from a number of sources onto the firestick. I can open the app, choose servers, change preferences, but when I connect, it says my visible IP address is exactly where I am at home. I.e. My IP address has not vanished! My account works perfectly on my iPhone app. It’s just the firestick that seems to not be working. Hi Nathan, thanks for the reply. I have checked my visible IP address using a couple different methods. I’ve tried indigo system settings and also through the downloader browser using the ipmonkey website. I’m a little unsure which variants of the firestick I have. I have one with voice control and also one without. When I checked how to find the generation level, the method I found was to check the software level – I did this and it looks to me like they are gen2. Hewzi, does this happen for both Fire Sticks? Since it is working fine for me using a Fire Stick with Alexa Voice Remote, then I wonder if there is an issue with the older models of Fire Stick. I think there is probably something incompatible with the firestick. Hewzi, sorry it didn’t work out for you. Since you had new and old FireSticks, can you confirm if you tried this with both of them or just the old one? I want to know if it’s an issue with the 1st gen FireStick or something else. Do you have to turn the ipvanish on and off every time you use kodi? Or does it just automatically turn on itself ? You could leave it on all the time. The only time you would want to turn it off is when you want to use something like Netflix because they have VPN blocking technology. Hi Nathan. I think I’m having the same problem as other people. I got IP Vanish up and connected but it still shows my visible IP address hasn’t changed. Jumped on Indigo and it also shows my External IP address as my original unchanged location. What am I doing wrong? David, I’ve now heard from a few people who are using 1st gen Fire Sticks running into the same issue. I guess the 1st gen Fire Stick still doesn’t support VPNs, even though the app now appears to work. I’ll update the post soon to address this situation. Ok, keep me posted. Gracias. I changed my Ip vanish password on my account and I am unable to update password on firestick. I figured I’d uninstall and start over but I can’t find option to do that either. Hi Nathan, I have a 1st gen firestick too & like David Carson, encouraged by finding this article (& that there now appeared to be a ‘workaround’ for 1st gens) – opened an iPVanish a/c. Installs fine, ‘appears’ to work (location changes etc), but on checking “Indigo” – the external IP address is still the same. In EU there may(?) be changes coming re: streaming – (unsure of status) hence going for VPN. So looks like I’ve paid for vpn, but to no avail. Will buy a 2nd gen firestick pending on what you hear/find out – thanks. Steven, thanks for your comment. Yes, I’ve been hearing multiple comments from people this past week saying that the 1st gen Fire Stick installs and appears to be working, but it’s not actually working. There must be some kind of hardware limitation with the 1st gen Fire Stick that prevents a VPN from working on it. I’m going to update this post to let people know that they’ll have to buy a 2nd gen Fire Stick (http://amzn.to/2rnfxNq) for this to actually work. Thanks a lot for getting back so quickly Nathan. (PS – on re-reading, I realise I’ve made it sound a bit like you’ve ‘recommended it’ – whereas you were only going on the info. you had at the time). Would’ve got a VPN anyway. But looking around, can’t find *anywhere* else that reckons 1st gen firestick’s *are* supported – so I think (with the update to Kodi), that iPVanish now installs, but is still stuck (possibly more by its own architecture) than a software issue ‘we’ can do anything about. But thought it was worth putting up another ‘doesn’t work for me’ in case people were still searching, But everywhere else is “N.B. – Won’t work for 1st gen fire sticks” – even some quite recent stuff. Many thanks – think it’s worth getting the 2nd gen. Thank you so much for the testing and feedback. Since I only have a 2nd gen Fire Stick myself, I couldn’t test it. At first, I had looked it up and found that VPNs don’t work with the 1st gen Fire Stick. Then, after a big OS update, I started getting lots of comments from people telling me that IPVanish started working after the update. It turned out that it wasn’t actually working, but was just appearing to work. I updated the post today to let people know. Thanks, again! We’ve got 2nd generation Firestick. Full updates done. Installed and able to login and connect with IPVanish. Tested external IP through Indigo. Still not changing. It’s still showing our original IP. IPV shows connected e.g. to USA but still not amending external IP. Not sure what we’re doing wrong? Really? I tested it myself last week. Just to confirm, did you back out to the previous screen in Indigo and then go back into the System information screen to refresh the external IP after you’re connected to IPVanish? Yes. Tried it a couple of times. Gave it different amounts of time too to ensure the system refreshed and nothing. Works fine on phone etc but Firestick def a problem. So I installed IPVanish and all was working fine but today it wouldn’t connect. I click on connect and it would go through all the way to authenticating and then nothing would happen after that and it would still say disconnected. Any suggestions? Internet, fire stick, and TV were all working fine. Try force closing the app and reopening it. Or try to sign out and sign back in. It’s under the 3 dots in the account page. So I don’t need to purchase IPVanish?? No, you would still need to purchase VPN service from IPVanish. This tutorial shows you how to use that paid service on your Fire TV Stick. Ok thanks. Also, I got my firestick mainly to watch UFC events. Is there a way I can record those live events? You watch the events on the FireStick and you want to record them from the FireStick? I think you would need an HDMI capture device, like the one from Elgato. What’s not working? Signup up on the website or using the VPN after you signed up? You’re outside the UK, right? I’m trying to stream geo-locked content from outside the UK too, and it fails to work for me too. I’ll be contacting IPVanish for a refund – 90% of the time the VPN services don’t actually work for unlocking geo-content – at all. It makes me wonder if IPVanish works at all to hide your traffic, or if it’s just a massive placebo. Go to Contact Us on their homepage. My previous reply to you wasn’t approved for posting. When I turn on my Firestick it goes to an IPVanish screen that has a ‘Connect’ button in the top left corner and just hangs. I can’t back up to the main firestick screen or reboot my firestick using the remote (play and select). The home button on the remote doesn’t work for you? Usually that will get you out of any app, even one that’s locked up. Hunter, did you find a solution to this? i’m having the same problem with losing internet connection using the latest firestick. I have the latest Fire Stick, and I’ve had that happen a couple times where it loses all internet connectivity. I just unplug the power cable and plug it back in. When it booted back up, it had internet just fine. Hi, what are you trying to access through IPVanish? I wonder if it’s one of the services that have VPN detection. Also, how are you checking your external IP address? I downloaded and installed ipvanish on my fire stick, I use the fire stick remote app on my phone and I can’t use the remote while the vpn is connected. I’m so sad! Halo! Oh no. Did you lose the remote that came with it? Anyway, check the settings in IPVanish because I thought there was a setting to make the device accessible on LAN. Yeah I don’t see anything on the IPVanish app that says LAN in settings. My son threw our remote in the fish tank about 3 weeks after we got it. Like an idiot I downloaded the app for my phone too to see if running both IPVanish apps would somehow make it work. It doesn’t. I’m at a loss. Two things. Once I get the IPVanish app loaded and launched from my Firestick, will my browsing be private on my iPhone and computer as well? Meaning if I’m running IPVanish and watching tv but also want to occasionally browse internet on my phone, will that be hidden as well? Two, will IPVanish have to be launched every time I turn on the tv, say when I go to bed and wake up, do I have to turn on IPVanish again or is it always on once I turn it on and keep the stick plugged in my tv. Sorta new to all this. Appreciate your help. IPVanish only covers the device that it’s installed on. If you want it to protect your phone and your computer, you can install the IPVanish app on those devices too. Your account can work with up to 5 devices. Yes, you have to launch the IPVanish app and click the Connect button to be protected. However it has auto-launch and auto-connect settings so you don’t have to worry about it. I just got vanish on my computer, how do I get it on my fire tv?